March 29, 2017 - Like us now! Today we are going to take a look at Zong call packages which includes hourly, daily, weekly, monthly and power pack packages. Zong or China Mobile Pakistan (CMPak) is a 100% owned subsidiary of China Mobile Communications Corporation. Zong engages in the provision of cellular mobile voice and data services to the Pakistani market through 2G, 3G, and 4G technologies. The high standard2s of performance are testified by the service award of “No.1 Operator in voice and data services” by the Pakistan Telecommunications Authority (PTA). Zong has over 26 million subscribers and a market share reaching 20%. Currently, the 4G coverage extends to over 100 cities of Pakistan and this number is increasing day by day. Previously, we talked about Zong 3g 4g Net Packages, Zong SMS Packages, and Zong 3G/4G Internet Settings. Zong also provides a diverse range of affordable call packages at different rates to its customers. 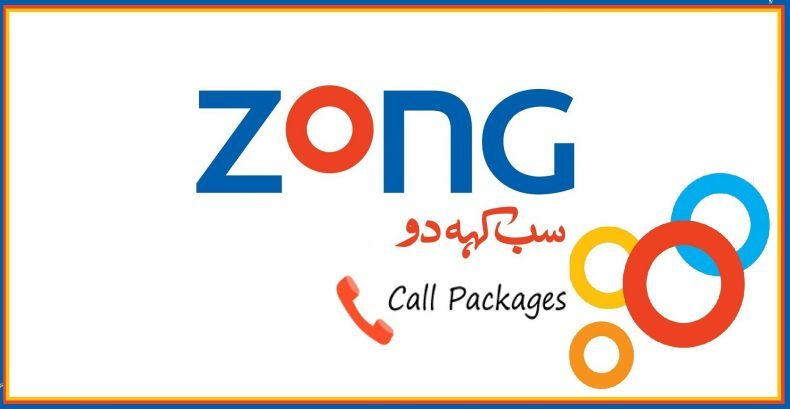 Here are the complete details of Zong Hourly, Daily, Weekly, Monthly and other call packages Including Zong to Zong call packages and Zong to other network call packages. With Super Student Call Package, Zong gives you the freedom to make unlimited calls to all Zong numbers and enjoy the fastest data network for any 2 hours of your choice in just Rs. 5 + tax. Zong Prepaid Daily Call Packages let you enjoy unlimited Zong-to-Zong calls throughout the day. Zong provides Prepaid Weekly Call Packages such as Shandaar Haftawaar Offer, All-in-1 weekly bundle and Weekly Unlimited Offer. * Dial *6464# and press 4, then press 2 for subscribing All-in-1 monthly bundle. With Power Pack Sim Offer, Zong provides tailored Prepaid Call Packages to its power pack customers. You can select from Starter, Value and Gold offers. For Activation and Further Details, call 310. SMS ‘BL’ to 567 to get complete information about your current Free Mins, SMS and Mobile Internet. You can receive your bill for Free by email, simply send EBSUB your complete email address to 3100. For change of email send SMS “EACNew Email Address” to 3100. This was all about Zong Call Packages. If we’ve missed anything, do let us know in the comments below. In the next story, we’ll talk about Zong 2G, 3G & 4G Internet Packages.